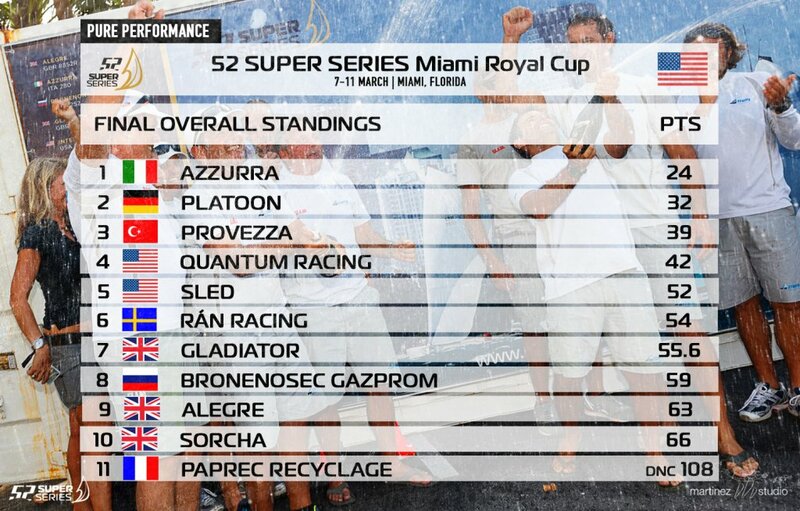 (Saturday 11th March, Miami) – In winning the 52 SUPER SERIES second regatta of the 2017 season, the 52 SUPER SERIES Miami Royal Cup, Azzurra proved once again that a team on the bounceback from a modest preceding event is often at its most potent. 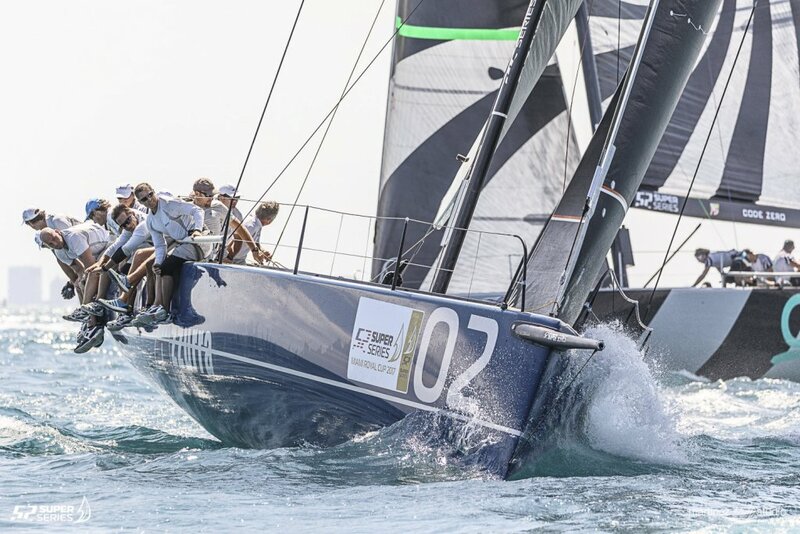 The emblematic team of the Yacht Club Costa Smeralda felt they were not at their best in Key West in January, lacking speed when they finished in fifth, seven points behind regatta winners Quantum Racing. But ongoing hard work, constantly striving to find that speed they felt they lacked, has been rewarded over the last five days of racing off the iconic Miami Beach, racing across a wind range of six to 22kts, when they posted seven results in the top three – including three race wins – from the nine races series to win the top trophy by clear eight points. Their impressive 24-points aggregate from the nine races compares favourably with Quantum Racing’s 43pt tally over the ten races sailed in Key West. In seven to 14kt E’ly winds Azzurra completed their winning scoreline with a third and a fourth today. The crew, led by Guillermo Parada with tactician Vasco Vascotto win their first circuit regatta since they triumphed in Cascais – the final event of the 2016 season – with a nearly facsimile run of points and final aggregate. Harm Müller-Spreer’s Platoon finish runners up just as they did when they were second behind Quantum Racing in Key West, so becoming the only team to have finished on the podium at both of this season’s events. Ergin Imre’s Provezza finish third despite a shaky eighth place in the last race of the regatta, but earn their third career podium place on the 52 SUPER SERIES. While the Azzurra team were certainly happy to pop the champagne and celebrate the win at Monty’s on South Beach, the knowledge that they will head back to Europe and the next regatta in May in Scarlino with the overall circuit lead and a boat that appears to have few weak points is even more comforting. A fast boat is one component to a regatta win. Another is a hot tactician and a cohesive crew. Vascotto was in step all week with the shifty South Florida wind, and while many of their competitors struggled at times with unforced crew work errors, the Azzurra team sailed cleanly throughout. “Obviously we need to enjoy today. We need a beer, for sure. A martini, Panini. We need to start thinking about the future because this fleet is working hard and if you’re asleep, you’re in trouble. 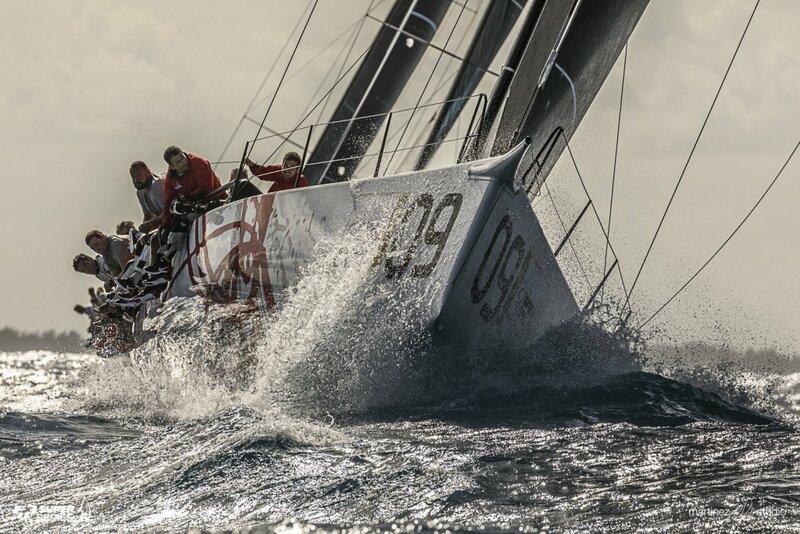 Another boat that will head into the four European 52 SUPER SERIES regattas with confidence is Platoon. The incorporation of tactician John Kostecki and main trimmer Dirk de Ridder – both have won the America’s Cup and the Volvo Ocean Race – into the crew line up for this season is appearing to pay off, so too the solid skills of Spanish Volvo racer, Pepe Ribes, as boat captain. While the team isn’t convinced they have solved their issues in lighter air, they did make significant progress. Meanwhile, Quantum Racing – the 2016 Champions – are on a learning curve with new helmsman Bora Gulari, who was steering his first regatta with the team. They will very shortly be back at their best, but were not at their sharpest off the start line and that made life tough at times in this white-hot fleet. 2. Platoon (Harm Müller-Spreer GER,), (3,1,8,2,7,3,4,1,3) 32 p.
“When we first line up this morning it was looking very random. During the line ups there were elevators [big lifts] on both tacks. Just like everyone we were trying to do a cleaner start and decide when you put in your first tack. It was more settled during the racing. I guess like all the week, we never know if it’s going to be a lefty or a righty. So a lot of it was starting in a clear lane and sailing straight, and deciding when you when tack. We managed to do this today. And then we had that first downwind, that help us. It was a good day, today and yesterday. It seemed that there was a lot of interest in the left, both upwind and downwind. What were you seeing there? It was quite shifty. You have to keep tracking what is happening. Sometimes it was light more than anything. Sometimes it was really powerful, like the last run. It was a powerful move not to be in the left corner, right corner looking downwind. It you do a clear start, things are much more easy. But the team, overall, has to be happy with two seconds in the two U.S. events? “He came with new ideas on how to sail the boat. The Vrolijk boats are slightly different, and in some conditions they are hard to sail. He came with new ideas and worked with a different team on the sails and it seems to be paying off. We are still feeling that the Vrolijks in some conditions are hard to sail, and that’s our goal – to minimise the bad days; to go through the bad days as best we can and minimise the points. “Obviously it’s a good relief because we had a hard time in Key West. We didn’t feel very fast, especially in certain conditions. So we work and we make a lot of changes. This week we have a completely different boat because every time that Vasco and Cole position ourselves in the proper place we immediately gain, which wasn’t the case last time. As I said a couple days ago, ‘glory doesn’t last forever’, but at least we make it last for two months, which is the biggest break of the season. Obviously now we need to enjoy and relax a little bit and in a couple of days keep working on analysing the whole data of the week, because, for example, today we didn’t feel very quick downwind. We need to keep working and pushing because we are sure everybody else will do the same. “I am always looking for the little bad things because I’m already thinking about the future. Obviously we need to enjoy today. We need a beer, for sure. A martini, Panini. We need to start thinking about the future because this fleet is working hard and if you’re asleep, you’re in trouble. Not a good regatta for Quantum? 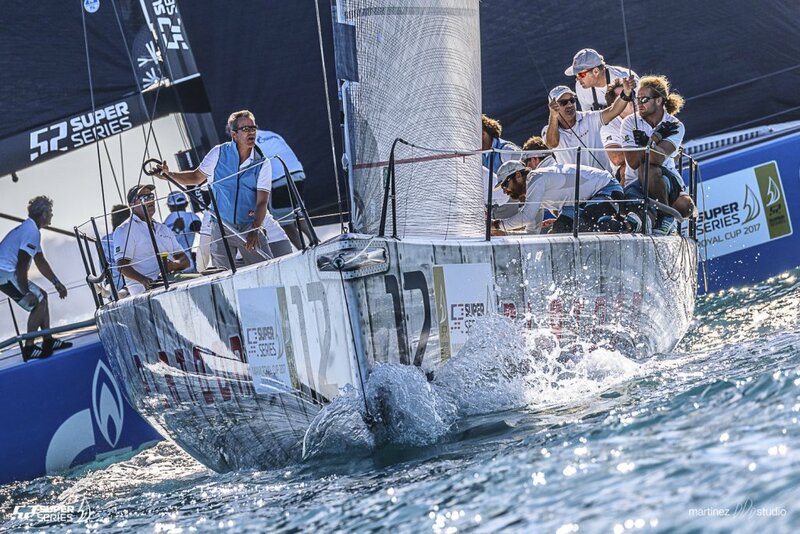 The 52 SUPER SERIES Miami Royal Cup will take place from 7-11 March. Live commentary and boat tracking via the Virtual Eye is available Tuesday and Wednesday. 52 SUPER SERIES TV powered by Quantum Sails goes live THURSDAY, FRIDAY, SATURDAY with live action streamed from the race course supported by tracking, commentary and comment from 15-minutes before racing starts each day. All available at www.52SUPERSERIES.com/LIVE and the the app.